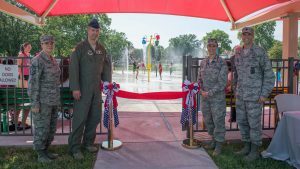 On July 18, 2017, Barksdale Air Force Base broke ground on a new dog park and water park for servicemembers, their families and guests to come enjoy. The project was finished on Feb. 2, but officially opened to all Department of Defense identification cardholders and their guests on May 7. Located on Billy Mitchell Road, the park is right beside the youth center on base. Jeremy Huggins, 2d Lt. USAF Public Affairs Officer, explains how they were able to fund the project. The splash park and dog park are open to anyone with base access and their guests. However, some breeds of dog are not allowed, so dog park visitors should view the rules posted at the entrance. 2d Lt. Huggins says they are excited to be able to provide a space for people to enjoy. 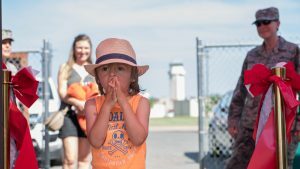 He also hopes the facilities will be a place where Airmen can make lasting memories. Barksdale personnel and their families have used the parks every day since they’ve opened. Huggins hopes that as the summer progresses, and with kids now out of school, they will continue to do so. Outdoor recreational activities are a great way for Airmen to spend time outdoors with their families and also their furry friends. The dog park is 24,000 square feet with lots of space for dogs to roam around. Huggins gives credit to their community partnerships for making the vision for this project a reality.